Practical Test Complete – Practical Test Complete is based on the UKs number one learning to drive software product called Driving Test Complete (as reviewed by Auto Express). This product has the 6 programs necessary to successfully pass the practical driving test. 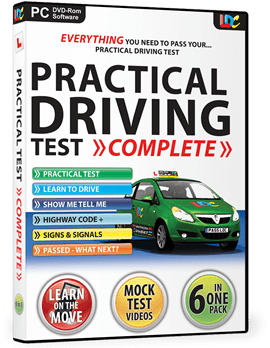 This DVD will enable you to hopefully pass first time and is more focused on the practical test than some of our other DVDs. Practical Driving Complete is not much a must have as a bit of an additional help so to improve your chances of passing your driving test first time this is a handy little tool to have.